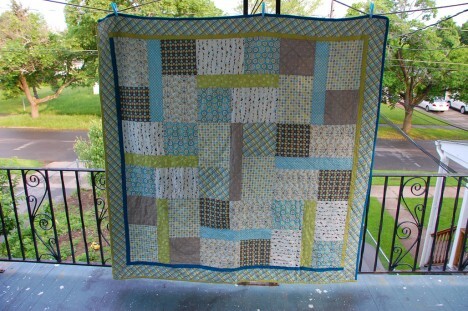 I lost a block for the Bird’s Nest Quilt at the beginning of May. I think maybe the dog ate it, but I didn’t want to comb the yard for evidence. It was a show-stopper; I didn’t have fabric to make a replacement. 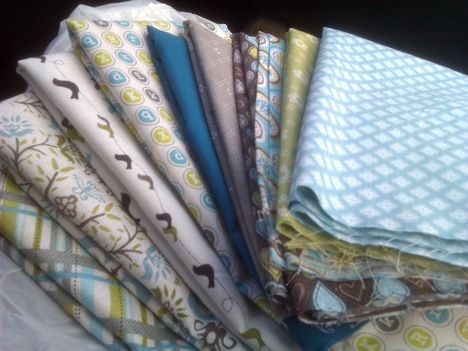 So, to console myself, I went fabric shopping at JoAnns. 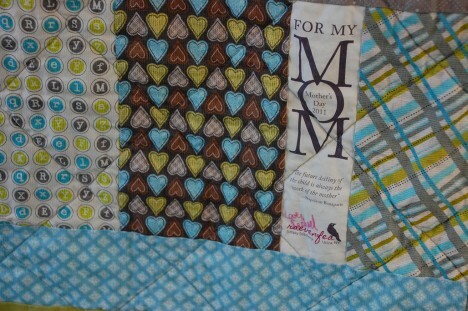 After all, Mother’s Day was a week away, and the missing block was for my gift to Mom. Luckily, I had the excuse of visiting this past weekend—3 weeks later—to give myself extra time to finish. to which I added Moda Clover (Bella Solids) from my stash and a light blue faux-batik print I have yards of in the stash to use on the back (75% off because of a streaky/splotchy print issue that went away in the washer. Yay). 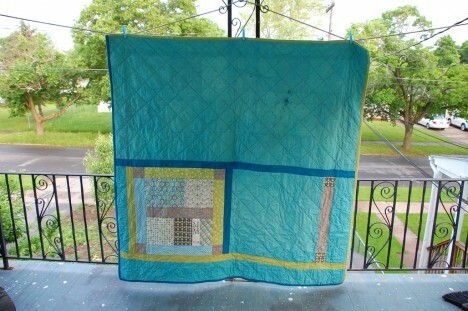 Since I was down to the wire, I needed a simple quilt idea, and nothing was coming to mind, but I found this pattern on allpeoplequilt.com that has 19″ blocks—super simple and interesting to boot. A couple of modifications (wider border, remove a row of blocks), and I had a quilt that took me under six hours to shop for and complete the entire quilt top. The directions were very simple. Aside from a dumb cutting mistake (can you figure out what it was?) that was my fault, not theirs, I had no major problems putting this together. Contrary to the instructions, the outer borders are mitered at the corner and the inner are log cabin-style. The borders are longer than WOF, but with the plaid, I found it was better to do straight seams to piece the fabric to get the length I need, rather than diagonal ones. I didn’t do the best job at matching, but the plaid hides the seams pretty well. It finished at around 70″ square, give or take. It isn’t perfectly square, and I didn’t have time or space to block it, but that’s no big deal. The back is pieced with extra front fabric and a custom label. Moof decided to add his own creative ideas to the back. He knocked down his gate while we were out and got ahold of an ink pen, which he seems to have chewed through while siting on the quilt (which was on the couch at the time). Some of it came out with a heavy dose of stain-remover and a wash, but hopefully Mom doesn’t mind that her “grandbaby” contributed. I may have forgotten about needing binding fabric when piecing the back, requiring a last minute run to the store for more of the dark blue. 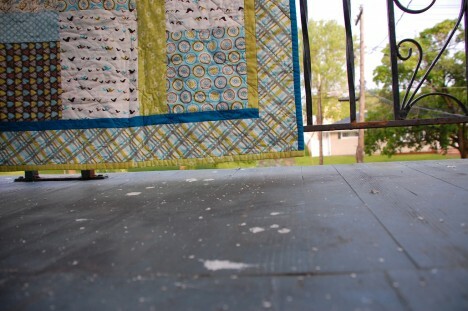 I couldn’t get my hands on any Clover quickly, so that part of the binding is pieced with scraps of one of the top fabrics. 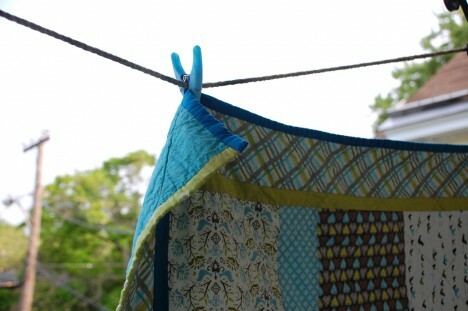 I wanted to echo the inner border’s dual color for the binding to tie it all together. Two corners are mitered, but the other two wrap around to echo the log-cabin piecing of the inner border. 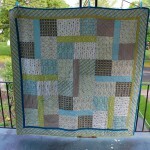 I quilted it all-over with a 4″ (more or less) spaced diamond grid in a medium-gray thread. On my list of things I don’t like about my current sewing machine: it is evidently impossible to get a walking foot with a guide, or buy a guide to fit on the machine. So, I tried to MacGyver one out of a chopstick and packaging tape, but it didn’t work too well. 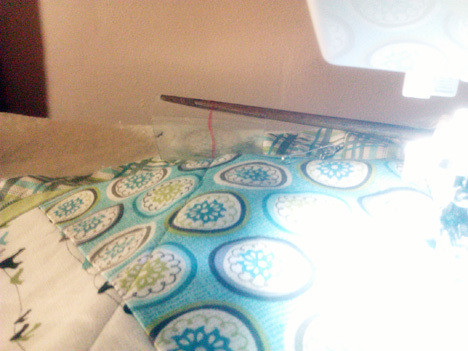 Luckily, the edge of my machine is about 3.75″ or 4″ from the needle, and I could kind of use that as a rough guide. Worked out well enough. Turns out, I was pretty unhappy with how the Bird’s Nest Quilt was shaping up—especially in terms of how it fit with my mom’s aesthetic tastes. 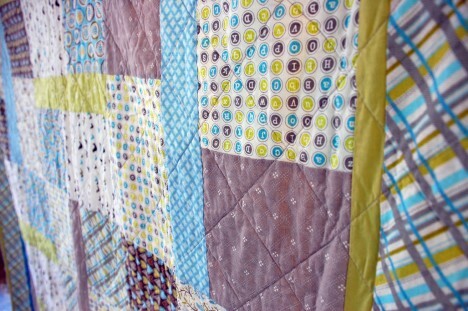 I absolutely love this new quilt and think it suites her better as well. I did find a charm pack of the fabric I was using for the snowball blocks, so I’ll finish the quilt some day, but right now, it’s in the UFP pile. 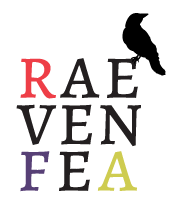 What do you do when you’re unhappy with a project? 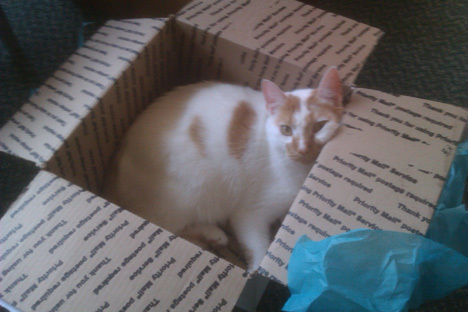 And just for maximum post cuteness, my sister’s cat was a big fan of the box I wrapped the quilt in.